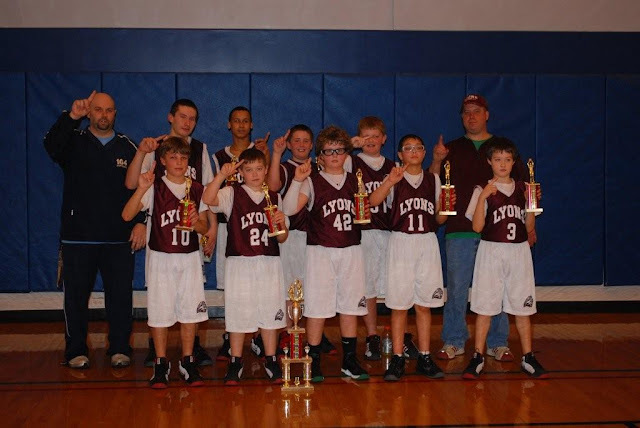 The Lyons 6th grade travel team received first place trophies for winning the 2011 Seneca Falls / Waterloo Recreational Boosters Basketball Tourney. We avenged our only regular season loss by manhandling them in their own house. Lyons 6th grade travel team CHAMPIONS! The Lyons Community Center is a great place in the local community and teaches kids how to succeed. 1 Comment to "6th Grade Champs - Lyons Community Center"
Congratulations!! This is the first step in bringing home the big hardware the Section V trophy someday. I remember some of my favorite memories as a kid was playing in the Easter Tournament at the Alex Eligh Community Center in Newark.